Homewood Suites by Hilton Hillsboro/Beaverton offers you thoughtful amenities to make you feel right at home. From proximity to many of the area*s attractions and a complimentary breakfast buffet each morning we have all that you need to make your stay a memorable one. Transportation Complimentary hotel shuttle within a 5-mile radius of hotel. Free hotel shuttle to Portland*s MAX Light Rail that commutes to downtown Portland and Portland International Airport. Taxi from airport to hotel is 60. Breakfast Complimentary *Suite Start* Hot Buffet Breakfast each morning that includes hot entrees Belgian waffles fresh baked goods and fruits. Dinner Reception Evening *Welcome Home* reception including hot entree side dishes salad bar beer and wine. Served Monday through Thursday. In-room Internet Complimentary Internet connection in all rooms. 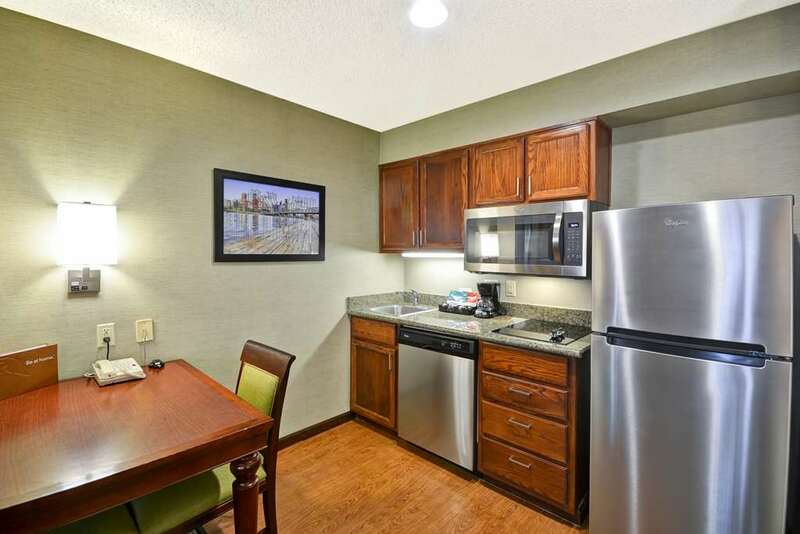 Kitchen Fully equipped kitchens with full-size refrigerator microwave stove-top and dishwasher in all rooms. Room Layout Spacious one- and two-bedroom suites with two 43-inch flat-screen TVs granite countertops cozy furniture alluring bedding package separate living rooms and sleeping areas in all rooms. Area Attractions Enjoy Oregon*s tax-free shopping at nearby malls and retail outlets. Walking distance to 3 restaurants and Streets of Tanasbourne mall is located within 4 miles of our hotel. Within an hour drive to Oregon*s notable Willamette Wine Country and Oregon*s coast. Located by several highly acclaimed championship golf courses. Hotel Guest Accommodations Our 24-hour fitness center is fully equipped with modern cardio theatre enhancement on all machines. Complimentary hotel business center with computers and printers. Hotel Meeting Room Availability 1150 sq. ft. of meeting space that accommodates different arrangements for meetings and events. Complimentary WiFi in the meeting room. Sweet Tomatoes: Healthy buffet restaurant including homemade soups and a variety of fresh salads.